For almost a year I've been trying to figure out what to get for a camera that's more pocketable than my Fuji X-T1 or X100S, yet more capable than my Samsung Galaxy S6 (which does a very respectable job but is quite limited). Somewhat to my surprise I ended up buying the Olympus Pen E-PL7, a small Micro 4/3 camera, along with a collapsing 14-42mm lens (28-84mm equiv). Here are some first shots from a visit to Mendocino on the Northern California coast, and some thoughts on why I picked this camera. 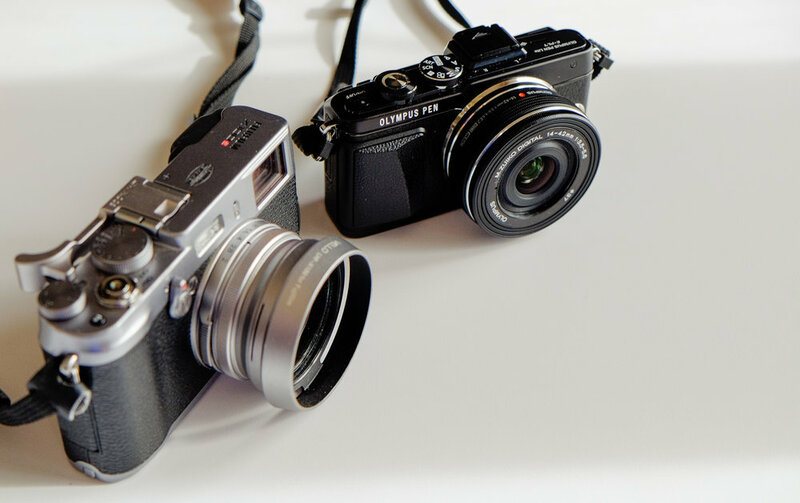 In my search I looked at the usual suspects - the Sony RX100 series, the Panasonic LX100, and a few others. All had pros and cons. The Sony undoubtedly creates excellent images, and it has a small but serviceable electronic viewfinder, which is a very nice-to-have. It's very small and self-contained (though TBH a bit too small and fiddly for me in use). But I just didn't enjoy using it - too gadgety. I buy gear that I enjoy using, not just that performs well technically. I also toyed with the Fuji X30, despite it being quite large and outdated at this point. Fujis are always enjoyable to use. I love the X30's mechanical zoom, the large EVF, the amazing Fuji color JPEGs, and it would mean not having to learn a whole new menu system. I almost pulled the trigger on it. There was another factor in my decision tree, however: night photography, something which I enjoy doing. A while back I attended a talk by an Olympus photographer, Frank Smith, at my local camera shop, Looking Glass Photo. Frank showed some of his night photography, and how he uses the "Live Composite" mode available on many Olympus cameras. I was super impressed by this capability, in which the camera automatically stacks multiple long-exposure frames together in real time, and stops exposing parts of the sensor that are already getting a lot of light, so that only the dark areas of the frame (e.g. sky with star trails) continue to get exposed. This greatly improves the quality of the finished image, and makes it a doddle to balance bright and dark areas. You can also see the image "develop" as repeated exposures build up, and stop it at any time. For this reason I'd been thinking I would buy an Olympus just for this purpose. Even the lowly E-PL7, which is largely pitched as a blogger/vlogger/selfie consumer camera, has this sophisticated, niche functionality. And the E-PL7 is quite small and light, is inexpensive for what you're getting, yet looks good, and has a sensor that is not state of the art but is still very good. I did also look at the newer and stylish Olympus Pen-F, which has a good EVF and a newer 20MP sensor as opposed to the 16MP that's in the E-PL7. But it's about 3x the price and considerably bigger and heavier than the E-PL7, and by most accounts the 20MP sensor isn't enormously better than the 16MP. So I just couldn't justify it given that this was intended to be a secondary camera to my Fuji's. This got me thinking of having the E-PL7 serve double duty as a small travel and informal usage camera, along with a night photography camera. While something of a compromise on size, this approach avoided having three specialized cameras all from different manufacturers, and I really wanted to avoid switching between user interfaces/imaging systems/color profiles/etc. as much as possible. The nifty 14-42mm lens (M.Zuiko Digital ED 14-42mm f/3.5-5.6 EZ to give it its full name, sheesh) has a motor that expands and collapses it again when you turn the camera on or off, and when collapsed is really quite small. The overall package is not that much bigger than a Panasonic LX100, though it lacks a viewfinder, and is significantly smaller than my X100S. An accessory EVF is available, and I may get that in the future as I prefer composing that way, and it will be useful for night photography as well. The 14-42 lens is decently sharp, but lacks some contrast and is quite susceptible to flare and fringing in a way that's hard to clean up in post, so you have to be careful (see the image crop of tree branches for an example). It's also quite slow at f/3.5-5.6. But for every day use in non-extreme situations, its perfectly fine, and for more demanding photos I'll pull out one of my Fujis. For night photography I'll get a dedicated lens, possibly the Rokinon 12mm f/2 so that I have extra width to play with, and the fact that it's manual focus is not an issue in that application. Lastly, I'm not really a fan of the 4x3 aspect ration of Micro 4/3 cameras, and prefer the more stretched 3x2 ratio that Fuji uses. But I'll live with it. Overall though I've been pretty happy with the E-PL7, and will continue to experiment with it to get the most out of it. I have not had a chance to do any night photography yet, so I look forward to checking out the Live Composite mode. I've shot a few short video clips and they've looked fine - though I'm no video connoisseur. But for my combination of purposes it looks like it's going to work well.